I never truly appreciated the garden tub in our bathroom until we didn't have it anymore. We did a bathroom renovation and opted to replace the tub with a big shower instead. Well, it wasn't long before I regretted that decision! We have since moved and have a garden tub again. Of course, now I can't find much time to enjoy a relaxing bath! So, these shower melts will be a great substitute for when I'm short on time but really want to relax. As an added bonus, they are inexpensive to make too! Place the lavender essential oil and corn starch in a bowl. Mix well. The mixture will look like a crumbly powder. Add in a few drop of both blue and red food coloring (optional) and continue to mix well. You may not notice a great deal of coloring until you do step 3 below. Add in the two tablespoons of water. Continue to mix to the colors disperse and clumps begin to form. Please note that this amount of water will NOT be enough to make the paste you are after. It is however a starting point so you can carefully ration water in and form your paste. Continue adding a few drops of water at a time, mixing well as you do. Once you have a thick paste, transfer the mixture to your mini ice cube tray. Smooth the mixture out flat. Freeze the contents for 1 hour or until the mixture is set. To use your lavender essential oil shower melts, place the melt on the floor of the shower and turn the water on. Enjoy the shower as you usually would, yet as the water and steam hits the melt it will break down and diffuse the aroma of the oil into the air. As long as you didn’t overdo the mixture with water, you do not need to leave the melts frozen. You can place them in a jar and store them in a cool and dry place. If your cubes seem like they are runny, opt to store them in the freezer instead. Don't forget to Pin this on Pinterest to save it! 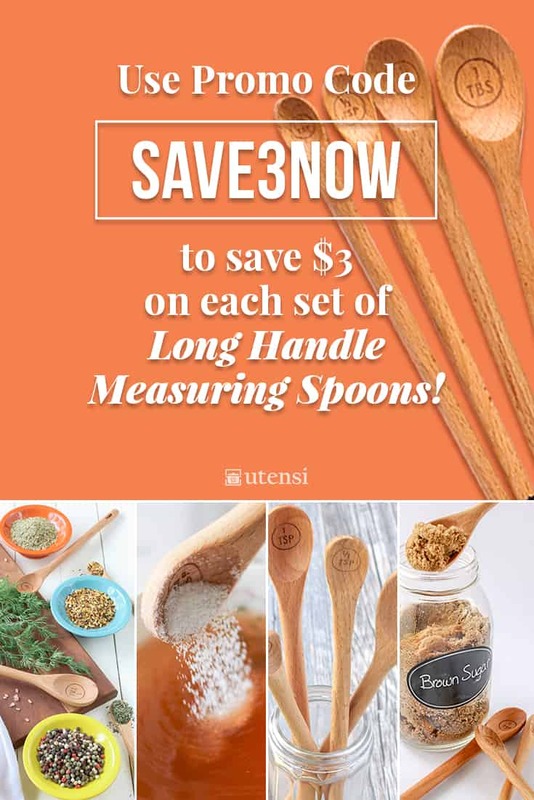 Use our long handle measuring spoons (and on Amazon) to measure and stir this recipe. 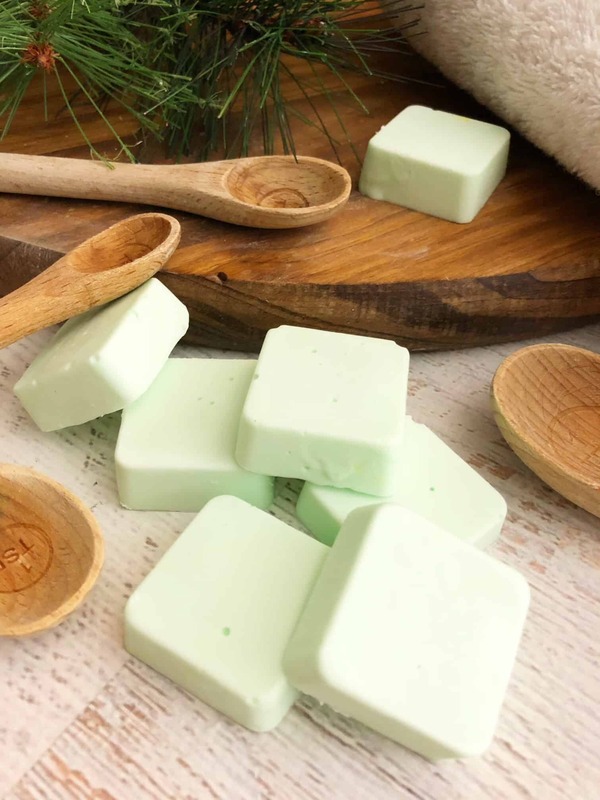 This Homemade Shower Melts Recipe is another one we love! Can you use any type of essential oil? Rebekah, yeap you sure can! The lavender is a great one for relaxation. Another good oil to use for stuffy noses would be peppermint oil or eucalyptus. Really whatever oil you prefer for their therapeutic properties you can add to the shower melts. Thanks for stopping by! How much of the essential oil did you use? Hi Amy, for the amount of cornstarch required in this recipe for the shower soothers, 5-7 drops is sufficient. You can always do more if you want something stronger. Hi, wanted to let you know I made these and featured them in my own blog. Thanks for the great idea! Suzanne, awesome, thanks for stopping by and letting me know! Can’t wait to start making these !! I have Gardenia essential oil, that should work until I get some lavender? Thanks for posting on how to make these. Shelley, yes, these can work with basically any oil that you prefer! How many melts does one recipe yield? Tara, if you use a mini ice cube tray, this recipe will make around 10-12 melts. I’ve been trying multiple ways to make these, with very little success. What is the texture you are wanting to achieve so that they will dry and set the right way? Last night I tried a baking soda/water combo and baked them but they’re so crumbly! Hannah, you will want them to be firm similar to wet sand. If you find that they aren’t getting as firm as they need to be once they are set, add more water to the corn starch. HTH! I just let my baking soda ones dry two days in the molds. Kat, thanks for that info! Others have asked if baking soda can be substituted in the place of cornstarch so it helps to hear others’ results with a substitution product like that! What is the shelf life of these shower melts? Susan, they should keep for about 3 months. We go through ours pretty fast though so we never have them longer than 6 weeks. Wondering if the food coloring ends up staining the tub? My husband would kill me! Dorene, they haven’t stained our tub or shower! I don’t think it would stain if you rinsed it right out after a shower. Maybe test a small sink first? I attempted to make these and they crumbled before my friends could get them home to test. They came out of the mold OK, but were very brittle and not able to be handled. They were a crumbly mess after one day. Erin, I would try to add more water to them to help them set. Wonder if you added plain gelatin if it would help to stay together better. And wouldn’t harm the natural ingredients in them. Lori, now that’s a good idea! Let me know if you try it and if it works out! How fast do they dissolve once in the shower? Curious if once the water hits they would just be washed down the drain in seconds? Hi Melissa, when you put these shower melts in the shower, place them the farthest away from where the water hits the most. That will ensure they melt slower. If you put them right by the drain, they will melt right away. I always place them in the corner and they last a lot longer that way. Does the cornstarch leave a goopy mess in the shower? Or does it wash away easily with the hot water from the shower? Ashley, no goopy messes here! They dissolve similar to how a bath bomb dissolves. Lisa, they should be fine to travel. I would store them in a mason jar so they stay a little cooler. Enjoy! Please help!!! I used a lot of my precious oils and the tablets/cubes aren’t setting up after removing them from the freezer. They just melt! I was hoping to use them for gifts. Can they be saved?? Debbie, if it were me I would add all of the tablets back into a bowl and mix them back together with some more water. You want the paste to be the consistency of a backing soda paste that you would put on if you had a bee sting. So, it won’t be crumbly but will be a little more liquid-like. I hope that helps! Please let me know if you were able to save them! 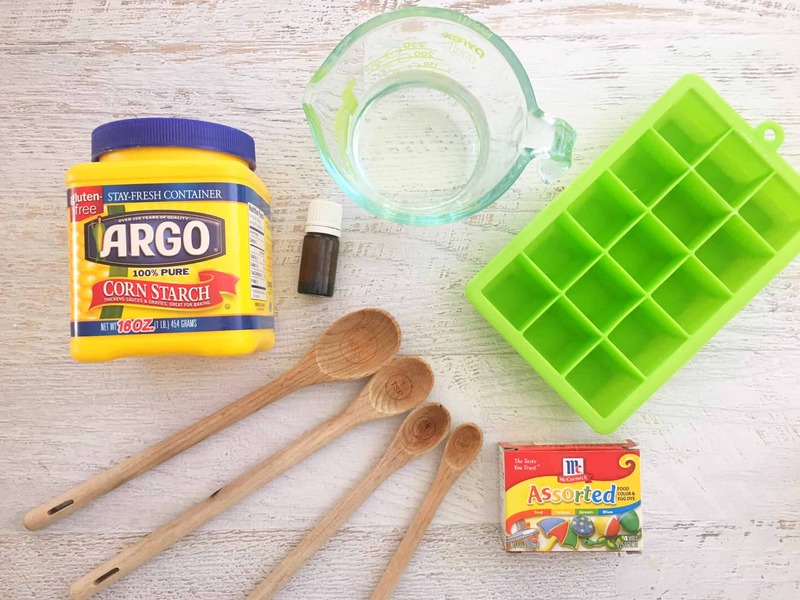 What is the difference in using corn starch and baking soda? I’ve seen recipes for both. Hi Bonnie, you can substitute baking soda too if you want. There are so many variations that can be made with different ingredients. It is all really personal preference. Hope you enjoy these! Do these have to be stored in fridge/freezer? Hi Patti, depending on the consistency (if they are super watery) you may want to store in the freezer and take out each one individually prior to using. I have been able to store mine in a large mason jar and then some were too watery and had to be stored in the freezer. It really just depends on how they turn out when you’re done. Hi Linda, yeap, you can sure use it if it’s cracked. It will melt in the shower anyway so you will be fine! Hello! I made these shower melts and they did not smell at all in the shower. Did I do something wrong maybe? Amanda, you can try adding more essential oils next time. However, because you aren’t smelling the essential oil doesn’t mean you aren’t getting the benefits from them. Also, some oils put off more fragrance than others so that could be a reason you aren’t smelling them in the shower as much. What a great idea, I’m trying to get over the flu. This recipe is easy enough for a woman to make even during time of sickness (hahah if you get it). I think I’ll make these with eucalyptus oil 🙂 Thanks for sharing! I ended up using about 1/2 cup of water because it kept clumping up into hard rock like pieces (I had to stab them out with my fork ) I also added about 10 drops of eucalyptus oil to my 1 cup of corn starch. The mixture ended up making about 3 cubes in my large silicone cube tray. They’re still in my freezer. We’ll see how they work. Erika, thanks for the feedback! Definitely let us know how they turned out! 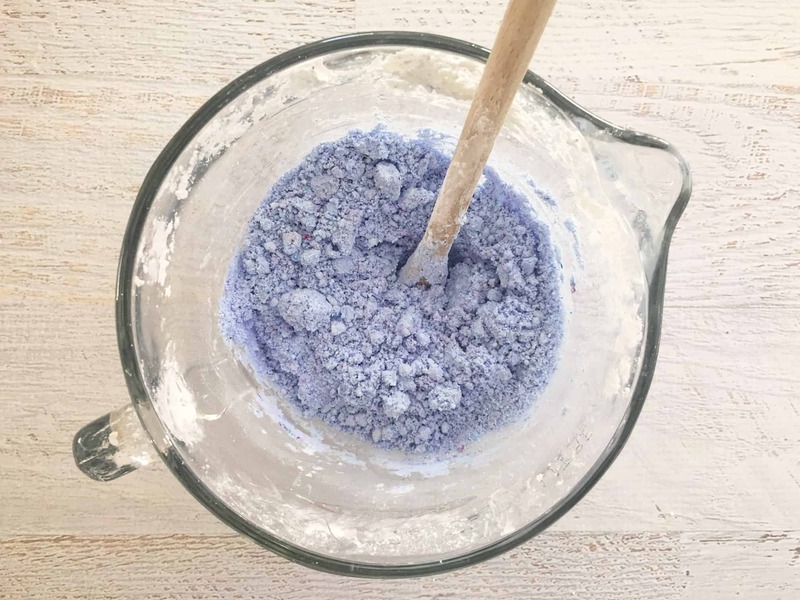 In this you said to use the lavender oil, but when I used my Lavender oil (the same one as you) the corn starch absorbed the oil and made ooblek. Jordan, the essential oil won’t change the color of the corn starch. Rest assured, the corn starch has absorbed the oil and will release when they melt in the shower. Hi… If u substitute corn starch for baking soda can you still freeze it to set it up or does it need to be air dried. If air dried can u bake it and if so for how long? Ashley, people have had success substituting baking soda. I would still stick them in the freezer to set up, depending on how much water you use. I haven’t tried to bake them before. If you try it, let us know how they turn out when baked. Thanks for stopping by! Can you make these in silicone molds? I bought some to make Christmas gifts and then didn’t get it done. I don’t have ice cube trays but if this is really a good reci8pe and people like it, I will buy some. Just hoping maybe someone made them in the molds. Kathy, yes you can make these shower soothers in any type of silicone mold. 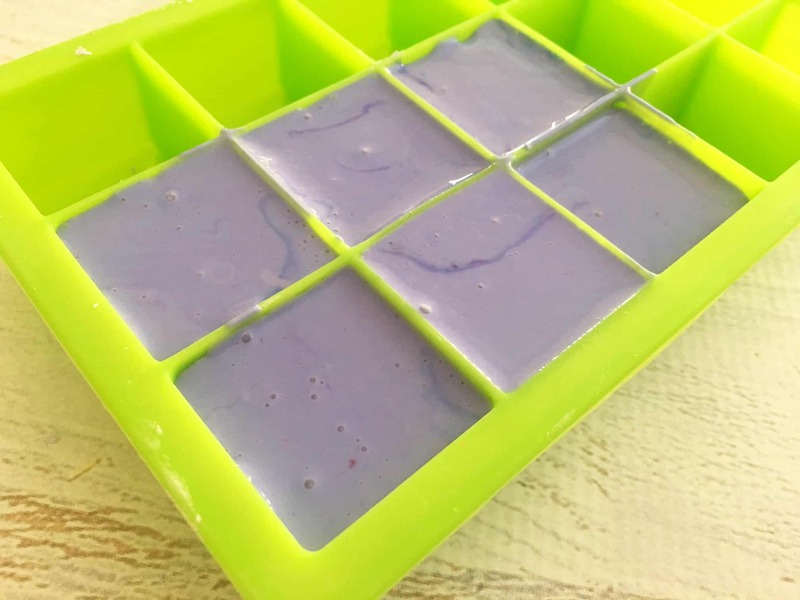 In fact, the recipe below uses a square mold if you want to check that one out here: http://savingslifestyle.com/homemade-shower-melts-recipe/. Also, you can find a fancy bath bomb recipe here: http://savingslifestyle.com/homemade-bath-bombs-recipe/. Just use whatever type of mold that you have to make the shape of the bath bomb that you’re wanting. Hope that helps! Hi!! 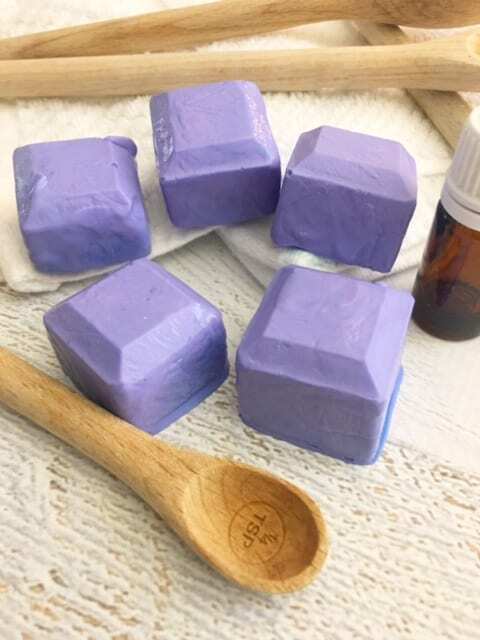 I’ve attempted to make shower melts before, but the recipe used baking soda. I had the darnedest time. If I let that them air dry, the aroma dissipated. I tried freezing them & then wrapping them in plastic wrap. I’m looking forward to using the cornstarch instead. I was also wondering about using food coloring. Hi Lady Bonser, let us know how these turn out for you using corn starch. The food coloring is safe to use but it is totally optional, more for decoration (I often times leave out). Thanks for stopping by! Do these make the shower slippery? Or do I just put the melt near the drain? Thanks! Hi Sharol, no the shower melts do not make your shower floor slippery. I place them in the corner of the shower. The water will hit the melt and allow it to dissolve more slowly when it’s not in direct contact with the water beating down on it. If it’s closer to the drain it will dissolve a lot faster. How long can you store them after making them? Evelyn, I would store them no longer than 6 weeks. Thanks for stopping by! I decided to try making bath bombs on a lark. I didn’t have any ice cube trays or special molds, so I used an empty Styrofoam egg carton. It worked beautifully! They were easy to push out from the bottom and if I wanted to use it over again, I could have by just washing the egg carton with warm soapy water. After pushing in the bath bomb material I pressed it in really well and let it dry for 2-3 days before removing it. Teresa, what a great idea and way to be resourceful! Hi Jennifer, I wouldn’t try potato starch as I think it would be too thick. However, if you try it let me know! What a neat idea! I love how inexpensive these are, too. Thanks! Hi Emily, thanks for stopping by! Yes, we love these shower melts. Let me know if you try them! Okay so I’m making these to sell at craft fairs. And for gifts. I made a bunch and they are all molding. But if I air dry them I’m afraid of losing the smell. Any help would be great! I use vacuum sealed bags for storage. Myndee, hmmm, the mildew is from the moisture. You could add less water and see if the batch will stick together. You could also add some citric acid and see how that would work. However, that may make it more like a homemade bath bomb texture. Let us know what you end up doing since others have mentioned trying to sell these at craft fairs too. Never heard of shower melts, how do you use them. Hi Jacqueline, you just place the melt in the corner of your shower (or farthest away from direct water) and let it “melt” away during the shower. The aroma will come out in the shower as it dissipates. These look really interesting and I’ve not heard of Shower Melts. Will be giving these a try using my soap molds. Thanks very much! Hi Lauren, yes, you must try them! They are so nice in the shower – my kids love them! Just made these with the kids..
Can we use this also as a bath bomb for kids? I made these, the mixture looked almost like glue but when you touched it it wasn’t wet, if that makes sense. I let hem freeze and they seemed ok, but I think I may have added to much water..? Hi Angela, thanks for stopping by! They sound to be fine if they froze well. You can try another batch with less water and see if they don’t need frozen. However, many people have kept theirs frozen as a preference too. Hi there, the shower melts won’t fiz. They sort of melt in the shower. Hi I want to make one you have a cold to open the airways . Hi Ellie, these would be perfect if you have a cold and need to open the airways too. I would use different essentials oils instead of lavender. Try adding Eucalyptus essential oil to help with congestion. Hello! My daughter is having a DIY Birthday party this Saturday and she wants to make these shower melts. I’m not sure which ice tray to buy. You said mini works best. The mini ones I have seen have around 90 little cubes. Is this what you’re talking about? Thank you!! I just made these as part of a gift basket for my best friends birthday. Only I used Stress Away essential oil and i made them green, they are currently in the freezer. Hope they turn out ok! Kayla, thanks for stopping by! Stress Away is one of my favorite essential oils too. I hope your friend loved them. What an awesome gift!